Followers of my blog know that I am a "lunatic" - that is crazy for all things Moon related. Well, I gotta' tell you this pic of the central peaks of the bright rayed crater Tycho is just UNREAL! Taken by the Lunar Reconnaissance Orbiter (LRO) it shows sunrise of the peaks in a way never seen before. Can you imagine being on the top peaks - the view you would see? In the original view you will see a large white boulder at the summit, cracks in the melted surface that cooled, all kinds of detail. Oh how I would love to be there. Space Shuttle Atlantis is GO for the last launch of the Space Shuttle program on July 8th at 11:26 a.m. EDT. 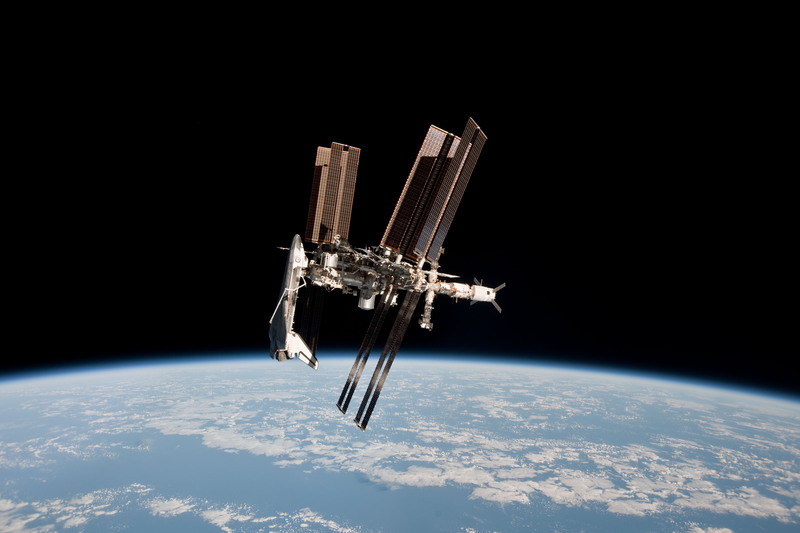 STS-135 will be the last shuttle to the International Space Station (ISS). The 4 crew members will be carrying an important resupply to ISS. Big crowds are expected at liftoff and I am hoping that we will be able to see Atlantis flyover - perhaps with the ISS - so we can see this for the last time ever. Take a look at this great article by NASA regarding the wild and wacky weather we have been having. I think you will find it enlightening. "The salt-rich particles have an "ocean-like" composition and indicate that most, if not all, of the expelled ice and water vapor comes from the evaporation of liquid salt water. The findings appear in this week's issue of the journal Nature." "There currently is no plausible way to produce a steady outflow of salt-rich grains from solid ice across all the tiger stripes other than salt water under Enceladus's icy surface," said Frank Postberg, a Cassini team scientist at the University of Heidelberg, Germany, and the lead author on the paper. When water freezes, the salt is squeezed out, leaving pure water ice behind. If the plumes emanated from ice, they should have very little salt in them." Water, water everywhere is the rule of the Universe I do believe....we have found it on Mars, our own Moon, comets and perhaps other moons in the solar system. We will have a CLOSE flyby of an asteroid discovered just this past Wednesday, on June 27th at about 1 pm EDT. As stated in the following Sky and Telescope article, "Asteroid 2011 MD, a chunk of rock estimated to be 25 to 55 feet (8 to 18 m) across, is expected to pass less than 8,000 miles above Earth's surface." While that IS close, we have had "close encounters of the closest kind" - an impact of a newly discovered asteroid. That happened in 2008 and was the first time in history that a discovered asteroid went on to hit Earth. Meteorites were recovered from that event as well. Once again we are reminded of the real threat that asteroids pose to our planet. While this space rock was spotted and determined to pose no threat to us this time around as well as 2022, there are literally thousands of unknown space rocks out there that might pose a threat. Fortunately this rock is small enough that it would PROBABLY break up in our atmosphere and PERHAPS produce meteorites. Solar Storm Preparations Meeting in D.C. I have had a few blogs on the Sun and space weather recently. You should follow the link to read about a meeting taking place this week in Washington, D.C. that addresses the issue of space weather and modern technology. 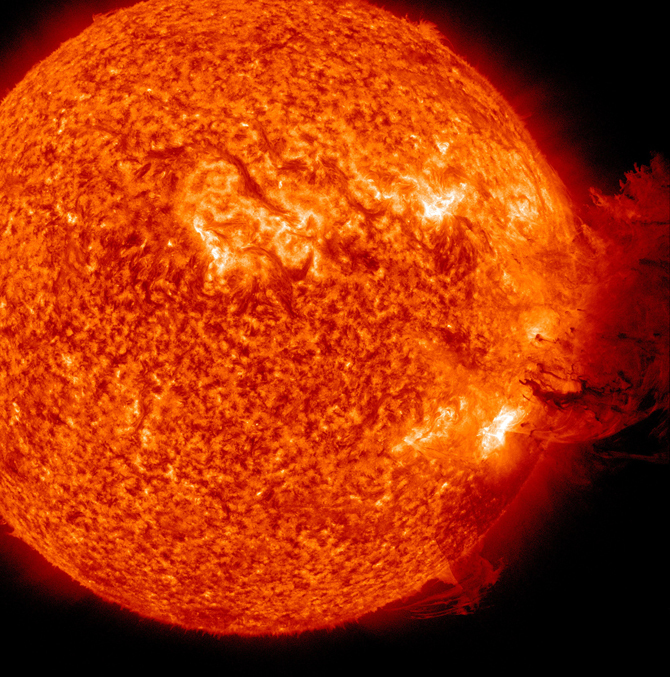 "In 2011 the situation (a powerful solar flare event) would be more serious. An avalanche of blackouts carried across continents by long-distance power lines could last for weeks to months as engineers struggle to repair damaged transformers. Planes and ships couldn’t trust GPS units for navigation. Banking and financial networks might go offline, disrupting commerce in a way unique to the Information Age. According to a 2008 report from the National Academy of Sciences, a century-class solar storm could have the economic impact of 20 hurricane Katrinas." Today, June 21st, at 1:16 pm, EDT, summer officially begins in the Northern Hemisphere. Down under it is now the first day of winter. The Sun will reach its' highest point in our sky today and start its' downward trek to winter 6 months from now. Night time hours are sorter but the stars, planets and Moon still are there for viewing. Make sure you get out and enjoy the evening air and take a look around. 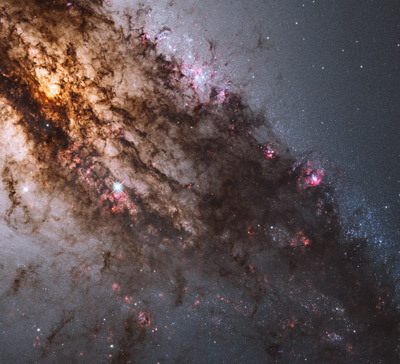 Check out this pic from HST that shows star birth in the Centaurus A galaxy. Quite impressive! NASA's MErcury Surface, Space ENvironment, GEochemistry, and Ranging (MESSENGER) spacecraft that has been in orbit around Mercury since March 2011, has been gathering data and photographs about the planet closest to the Sun. Some of the first results were released by NASA this past week and offers some intriguing insights. One thing MESSENGER has shown is that Mercury is not "just like our Moon", nad that it is quite a fascinating world. There was hope in the meteorite community that Mercury might have been the source of a meteorite called NWA-011 but it seems that is not the case. Also, the presence of some rimless, pit like features, high sulphur content, an offset magnetic field core and much more makes for interesting reading. We all take it for granted that the Sun will rise in the east and provide life-sustaining energy to our planet each and every day. After all, this has been going on for the entire history of humanity, let alone that of the Earth. The Sun became an object of scientific study when Galileo discovered sunspots in 1613. Following generations of solar scientists, intruments, observers, and now spacecraft, have added to our knowledge of the Sun. We can now see the entire Sun, including the side facing away from Earth due to the STEREO A and B spacecraft. We monitor the Sun 24 hours a day, 365 days a hear using SOHO and SDO spacecraft. We can even monitor the INTERIOR of the Sun using special techniques. All of this data obtained through observations has led to an an impressive body of research and resulting knowledge of our star. The Sun has been showing signs of being in the start of the Solar Maximum phase of its 11-year cycle, coming out of a very deep Minimum Phase where sunspots were pratically non-existant for a number of years, puzzling solar astronomers. Now it seems that the Sun is possibly undergoing a change in this 11 year cycle. There was a conference recently that discussed solar research and three scientists presented research papers that indicate that the Sun may have weaker than normal solar cycles for the present cycle and the one following. Just what would this mean for us? No one knows for sure but it is thought that there will be less solar activity which would mean less of a threat to our space satellites and power grid. It also might lead to a cooling of the planet and allow for an assessment as to the Sun's impact on climate. I PROUDLY state that I am a lunatic - a lover of all things Moon-related. OK, some who know me may apply other medical connotations to me, but that is another story! Goddard Space Flight Center's Scientific Visualization Studio (SVS) has taken data and images from the Lunar Reconnaissance Orbiter (LRO) and used them to compile a 2 1/2 minute movie that shows the appearance of the Moon for the enitre year. Tomorrow I will have Sun related news. NASA's mission to the giant asteroid Vesta is fast approaching the exciting stage - return of detailed images. Literally every day the images get better as the distance between spacecraft and asteroid shrinks. On July 16th the Dawn spacecraft is scheduled to go into orbit around Vesta for one year and then leave for a rendezvous with the dwarf planet Ceres. NASA has made a video comprised of images recently obtained of Vesta and tantalizing views are just beginning to come into view. I can hardly wait to see Vesta up close and personal. 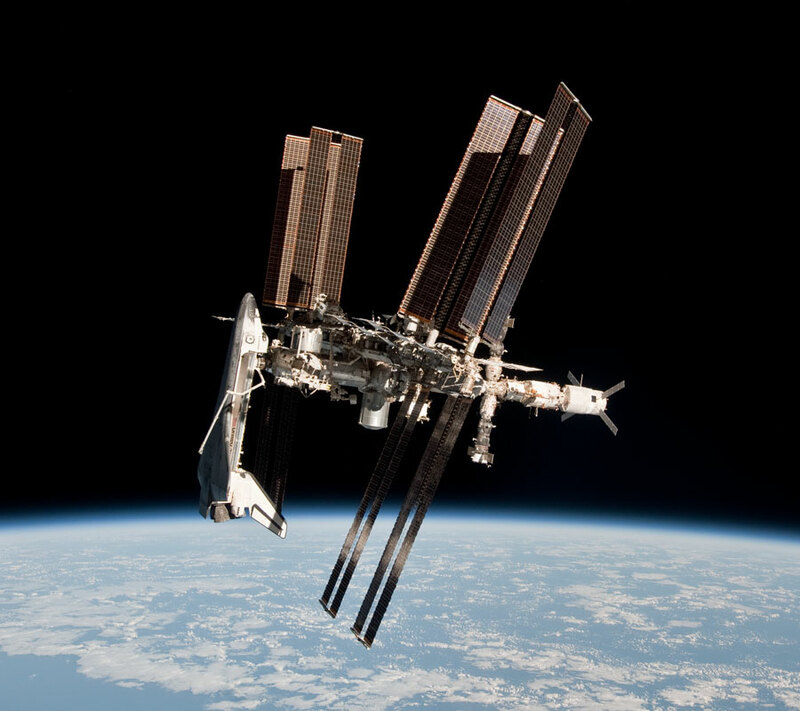 In the VA-MD-DC (and entire Northern Hemisphere) viewing area the International Space Station (ISS) is putting on a great series of viewing opportunities. With the great weather we are enjoying in our area for the next couple of nights I highly recommend getting out to see the ISS. Some passes are very long - on the 14th a little after 10 pm there is a 6 minute pass that will be almost as bright as Venus, passing nearly overhead in our area. Check out the following links: http://www.heavens-above.com/?lat=0&lng=0&alt=0&loc=Unspecified&TZ=CET (you put in your lat/long or pick your city) and http://spaceflight.nasa.gov/realdata/sightings/cities/view.cgi?country=United_States&region=DC&city=Washington (you can oick another city besides DC). I have been offline the past two days enjoying thunderstorms, the sounds of frogs at night, the flight of fireflies and the intense green that only central Virginia trees can produce. 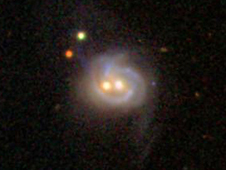 While this may look like a smiley face in space, it is a galactic merger taking place that involves two supermassive﻿ black holes. As stated by NASA, "The galaxy, which is known as Markarian 739 or NGC 3758, lies 425 million light-years away toward the constellation Leo. Only about 11,000 light-years separate the two cores, each of which contains a black hole gorging on infalling gas." "The Sun unleashed an M-2 (medium-sized) solar flare, an S1-class (minor) radiation storm and a spectacular coronal mass ejection (CME) on June 7, 2011, from sunspot complex 1226-1227. The large cloud of particles mushroomed up and fell back down looking as if it covered an area of almost half the solar surface. The Solar Dynamics Observatory (SDO) observed the flare's peak at 1:41 a.m. EDT (06:41 UTC). SDO recorded these images (above) in extreme ultraviolet light that show a very large eruption of cool gas. It is somewhat unique because at many places in the eruption there seems to be even cooler material -- at temperatures less than 80,000 K."
Galaxies like ours are composed of hundred of billions of stars. They have different masses which in turn determines the length of their lives, their temperatures and their ultimate fate. Stars like our Sun last about 10 billion years or so before they become Red Giant stars enveloped in a huge nebula of elements such as hydrogen, helium, oxygen, carbon, neon. At the center of the nebula the remains of the star's fusion core, now a white dwarf star, blazes white hot, slowly cooling until it is no longer visible. A white dwarf is a dead star the size of the Earth. If a star is roughly 8 times as massive as our Sun it has a far different ending and in far less time - a hundred million years or so. A massive star undergoes a cataclysmic end as a supernova, an event in which the star literally blows itself to smithereens and in the process manufactures all of the heavy elements beyond iron. Stars in their normal lives cannot manufacture elements beyond iron as iron absorbs the star's energy at its core and essentially shuts down the nuclear fusion cycle. But in the following stupendous blast as a supernova the destroyed star outshines all of the stars in its home galaxy. We live inside a barred spiral galaxy called the Milky Way Galaxy. It is hard to know what our galaxy looks like because we are inhabitants - imagine trying to figure out what your house looks like on the outside while confined forever to a small section on the inside. Our Galaxy is beautiful - if you get outside this summer at a dark sky site you will be able to see this for yourself. Summer begins on June 21st at 1:16 p.m. EDT and marks the longest period of sunshine for the year. With the shorter nights of summer there is still plenty to see in the sky and experience in local area events. Mercury will be low in the west-northwest after sunset beginning June 22nd. If you have a clear and unobstructed horizon you should be able to see golden-yellow Mercury. On the 30th Mercury will be lined up with two stars – Castor and Pollux, and will be on the left. This will help zero in on this elusive planet. Venus is low in the east-northeast and visible about a half hour before sunrise. Mars is dim in the east-northeast and visible about an hour before sunrise. The thin crescent Moon will be just above and to the right of Mars on the 28th. Use the Moon as a guide to finding Mars. Jupiter claims its’ title “King of the Planets” as it dominates the eastern sky several hours before sunrise. Saturn is up in the south sky at sunset. The ringed planet is very close to a famous double star, Porrima (Gamma Virginis) all month long. The two will be closest on June 11th. Saturn is the brighter of the two and both will be visible in a telescope eyepiece – quite a sight with Saturn’s rings and a double star in the same field of view! The Moon glides below this duo on the 9th and 10th. 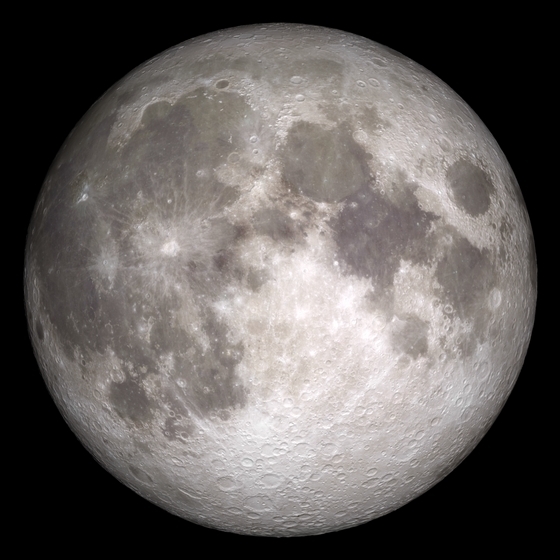 New Moon is on the 1st, First Quarter Moon is on the 8thth and this month’s Full Moon occurs on the 15th. This month’s Full Moon is called the “Full Strawberry Moon” in recognition of the strawberry harvesting season. Last Quarter Moon is on the 23rd. Just before dawn the waning crescent Moon passes below the Pleiades star cluster on the 28th. The National Capital Astronomers (NCA) have their monthly meeting on the 11th at 7:30 p.m. at the University of Maryland, College Park Campus Observatory. The meeting will be dedicated to Science Fair Winners + Pizza! The Northern Virginia Astronomy Club (NOVAC) will meet at 7 p.m. at George Mason University (GMU) on the 12th. The speaker is Robert Zimmerman and his topic is “What's Past is Prologue: Predicting the Future of Space Travel”. Read More About It: http://www.novac.com/meetings/index.php. NOVAC will hold a public star party at Great Meadows on the 24th from 7:30 to 11:00 p.m. The TriState Astronomers General Meeting will not have a meeting this month as the Brish Planetarium is closed for the summer. We have a new addition to our monthly events, the Astronomical Society of Greenbelt (formerly the Greenbelt Astronomy Club). ASG will hold a star party on the 11th and 25th starting at 9 p.m. at the Northway Field and Observatory. ASG will meet on the 30th at 7:30 at the Greenbelt Community Center. Get out and enjoy the sky and the great events this month. I recently wrote (May 25th) about Spirit, the Mars Exploration Rover that has failed to respond to communications from Earth. It is well worth your time to view this splendid production. 4,000 TITLES NOW AVAILABLE FREE TO ALL READERS! I love books, especially science books, but they can be expensive. The National Academies Press has provided a treasure trove of free reading to those so inclined. I urge everyone to check out the available titles and enjoy some free science reading in the summer. 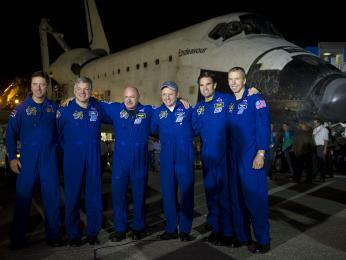 A picture is worth a 1000 words.....the crew of Endeavour/STS-134 pose in front of their spacecraft after a successful landing at Kenneday Space Center at 2:35 a.m. Endeavour will now be retired and become a museum exhibit. Space Shuttle Atlantis is now at Pad 39A, awaiting her final launch and that of the Space Shuttle program.